Proving that their line-up is the gift that keeps on giving, BOOM! Studios puts on another great spread in December. 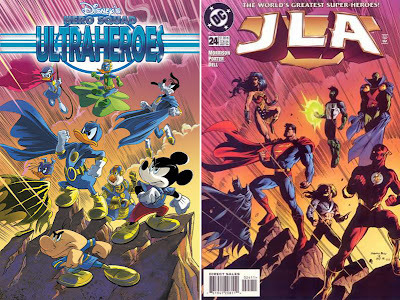 First up though, I have to chuck up this cover to Disney's Hero Squad UltraHeroes Vol3, a homage to Howard Porter's cover to JLA #24. I can't find a cover credit for the Disney based version (I'm guessing Ettore Gula or Stefano Turconi), but it definitely went down the right way with me. Right - on to the other highlight-able covers! ARTIST AND TITLE (Left to right): Michael Cavallaro - Toy Story: Tales from the Toy Chest #6, Christian Nauck - Incorruptible #13, and Gene Ha - Stan Lee's Starborn #1. Full December BOOM! solicitations after the jump.